The crowning achievement of the great English potter Josiah Wedgwood was a dinner and dessert service decorated with hand-painted views of England, Scotland and Wales, commissioned by Empress Catherine the Great of Russia. Known as the Green Frog Service, it provides one of the finest surviving pictorial records of 18th-century Britain. Commissioned and produced in 1773-4, the Service was destined for a 'palace' Catherine was building in English Gothick style as a staging post between St Petersburg and her summer residence at Tsarskoe Selo. Surrounded by marshes, the palace was known as La Grenouillère, hence the device of a bright green frog that appears on every piece of the Service. The Empress particularly asked for views of landscape gardens, and many of the finest gardens in Britain are depicted, together with a great array of 'Antiquities' – ruined castles and abbeys, old manor houses, Cornish dolmens – as well as romantic landscapes, views on the Thames at London and even early industrial sites. This commemorative book, which was published in 1995 to mark the 200th anniversary of Wedgwood's death in a special edition for subscribers, remains available in a limited edition for non-subscribers. It presents for the first time the entire Service in colour and monochrome plates, with over 350 large detailed illustrations, 60 colour plates and more than 1,000 reference illustrations, with entries on each of the places depicted. It also includes essays on the making and decorating of the Service, the remarkable history of its survival in Russia, and on Catherine the Great's passion for things English. 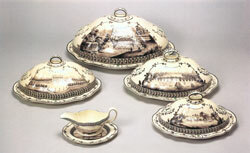 Above: Group of covered serving dishes and a sauce boat from the Service. 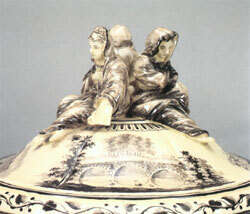 Left: Figures of Ice, Cold and Winter, supposedly modelled by Josiah Wedgwood, on the lid of a glacier (cooler); the bridge is from a view in Shugborough Park, Staffordshire. Contents include: The Green Frog Service by Ludmila Voronikhina; Josiah Wedgwood and Queen's Ware by Gaye Blake Roberts; Catherine the Great and the English Style by Michael Raeburn; Annotated Catalogue of 1,222 Views and their Sources by Ludmila Voronikhina and Michael Raeburn. We are continuing to offer a 50% discount to original subscribers who wish to purchase copies of this trade edition. To take advantage of this offer, please email Cacklegoose Press with your name and address and the number of your copy of the subscribers' edition.